Under its new two-child policy, China will now allow all married couples to have two children. Considering the United Nations once estimated China’s human population was estimated would hit 9 billion to 9.7 billion by 2050 2 before this momentous move, this is big news indeed. We delve into this pivotal decision, and shed light on how this historical move could impact China, as well as international real estate markets. Whatever the actual figure would be, the fact remains that China’s household consumption will undoubtedly soar in many sectors following the implementation of the two-child policy. However, in a land where property is king, more demand for family living space also translates into rising property prices – on top of the already inflated housing prices – in China’s Tier-1 cities and Tier-2 cities. In the face of this, Chinese parents with the means may be more inclined to consider a larger home overseas, which offers more value for money. Clearly, raising a child in China is not cheap – even more so when you factor in the child’s education, which is highly valued by Chinese, and is considered one of the most important long-term investmentsfor Chinese. This, in turn, could motivate Chinese parents to look across borders for better education opportunities, especially as many deep-pocketed Chinese aspire to provide their children with an Ivy League education. 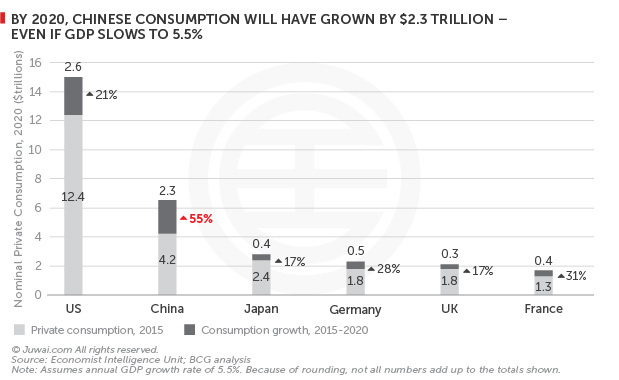 China’s consumer-centric and services industries – including hospitality, leisure, and entertainment – have not been affected by China’s current economic tumult, remaining on the upsurge. Let’s not forget the visa relaxations by the US, the UK, Canada, Australia, and Japan, as well as Europe’s Golden Visa offerings – all which are favourite travel destinations for deep-pocketed Chinese. At this point, international property agents and brokers should start rubbing their hands in glee, as Chinese buyers tend to property hunt while on holidays abroad – all at the same time. Juwai research reveals Fly ‘n Buy Chinese have a penchant for buying property in holiday destinations they have fallen in love with. Overall, the two-child policy is largely seen as the right move for China’s economy as it seeks to move towards a more stable and sustainable long-term growth. Need we say more? We’ve all seen first-hand how a robust economy and consumption could translate into strong spending and property investment overseas by cashed-up Chinese. Fact is, Chinese are still buying properties abroad like there’s no tomorrow. China’s outbound spending is also slated to grow exponentially within the coming twelve months. China’s Ministry of Commerce says 6.5 trillion yuan (US$986 billion) is expected to be spent on cross-border e-commerce alone in 2016. When you factor in these with what we’ve outlined above, what you end up with is a compelling argument that Chinese – whether as travellers, students, investors or luxury consumers – will not be disappearing anytime soon. This will become even more apparent, seeing as China’s first Golden Week of 2016 is just around the corner, when China’s wealthy will have seven days of public holiday to jet overseas to holiday and property hunt. That said, any self-respecting agent aiming for the China market should already know this, and would have their China campaign and strategies at the ready. New to the Chinese market? There’s no time like now to start marketing to this massive and ever-expanding market, which will be well worth your while.